Electricity costs now form a substantial component of the data centre operational expense base, in fact since 2004 they have outstripped depreciation of IT equipment within the data centre as an expense. Cooling inefficiencies remain a key driver of power consumption within data centre environments, and one that data centre managers can influence. Effectively cooling new network, server and storage technology can be problematic in older data centres because of the high heat loads generated by high performance chipsets. Whereas delivery of more power in an existing facility is often achievable, additional cooling capacity can be rigidly constrained by logistics and building design e.g. lack of roof space. Even new data centres can struggle with the heat loads generated when blade-servers and other high heat output technologies are deployed densely, increasing power densities beyond IT suite design criteria. The significant capital investment associated with traditional solutions (new data centre space, upgraded mechanical plant, liquid-cooled cabinets, relocation to highly specified co-located space) is typically unattractive or infeasible in the current fiscal climate. Against this backdrop, expected Government initiatives to charge for carbon emissions, publish enterprise energy usage and lower carbon emissions have also reinforced the need for firms to measure their data centre efficiency and devise steps to improve it, to safeguard their fiscal and reputational positions. The diagram above illustrates the type of virtuous cycle that companies will have to adopt in a bid to achieve improvements in their data centre efficiencies. The Green Grid has been actively promoting Power Usage Effectiveness or 'PUE' to measure this. 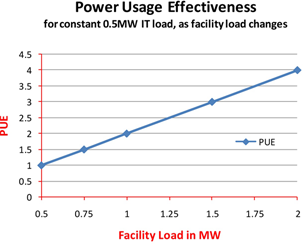 PUE = Total Facility Power / IT Load. Its reciprocal is DCiE (Data Centre infrastructure Efficiency). The consumption of power by a data centre is typically broken down as illustrated below. To improve data centre efficiency, as measured by PUE, requires the facility power consumption to be decreased without a concomitant decrease in the IT load. In the example below, a PUE of 2.0 is derived. The actual PUE attainable, and the approach to improve an existing figure, depend on the Tier status (built-in resilience) of the individual data centre, M&E design and the server occupancy level. Involves significant capital investment and invasive / difficult changes. Superior application / technical architecture designs. But this will increase PUE, despite providing a beneficial decrease overall in enterprise energy consumption (in this case Data Centre energy Productivity - DCeP - is a better metric to use to target optimising IT load versus useful application work). Air containment technology to prevent unwanted mixing of hot and cold air. Energy efficiency cannot be optimised at a point in time and then forgotten about because data centres are dynamic environments, as is their external environment. 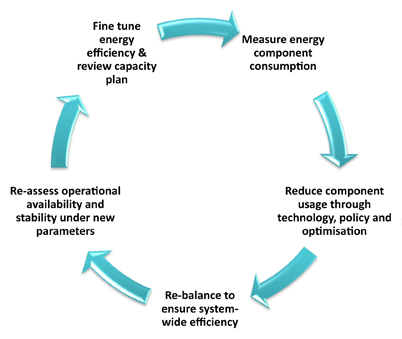 Therefore to optimise operational energy efficiency and Operational Expenses, continuous measurements must be made of key parameters to allow the level of efficiency to be understood, and a benchmark performance from each major sub-component established. Keyzone can help you select and install probes and sensors to record key metrics and automatically calculate Key Performance Indicators (KPIs). We can then advise on how to change elements of the data centre infrastructure to enhance efficiency, reduce energy consumption and save costs. In addition to temperature and humidity sensors described in our Accessories - Temperature and Humidity Monitoring section, power meters are required to accurately record the electric consumption of high energy consumption infrastructure - as recommended by the UK Government Carbon Trust. Our specialist partner can supply and install current transducer meters to provide continuous consumption recording. Furthermore, these devices can be networked to provide a consolidated, and automated set of relative efficiency and absolute consumption measures.